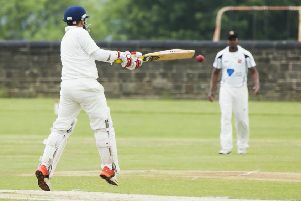 King Cross Park beat title-chasers West Leeds 26-20 in Division Three of the Pennine League on Saturday. Only points difference separated the second and third-placed teams before kick off and there was little between them on the field. After absorbing repeat sets of pressure, Park began to complete their own sets and smart handling enabled winger Talor Foulds Clare to finish in the corner. Disciplined play led by experienced man of the match Lee Brook at loose forward opened a huge gap for prop Nathan Raynor to score his first try for some time. A minor positional change led to major disruption in defence and West Leeds scored three tries to storm in front. On the stroke of half time full back Josh Robertshaw snatched the lead back at 18-16. Defences were on top in the second half and it took skilful handling to enable powerful winger Matty Ward to maintain his try a game record this season. A chip and chase try by West Leeds closed the gap again to leave a nerve jangling final five minutes. However, Aaron Brook kicked a penalty goal to add to his four successful conversions and that was ultimately the difference between the sides. King Cross Park are two points behind leaders Seacroft Sharks WMC with two games in hand.